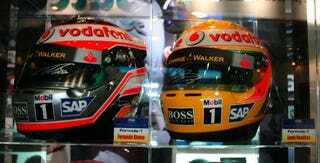 Tokyo Motor Show: Alonso and Hamilton Helmets — BFF! The smart money's not on Fernando Alonso and Lewis Hamilton spending another season together in the McLaren stable. But though neither won the F1 championship, and Alonso's probably flying the coop, their crazy, controversial and thoroughly enjoyable season was immortalized at the Arai helmet display at the Tokyo show, as their signed helmets sat side by side.